Ever since I received my second piercing (second lobe) I have been in love with piercings and creating fun looks with my earrings. On July 2nd I acquired my right daith piercing. 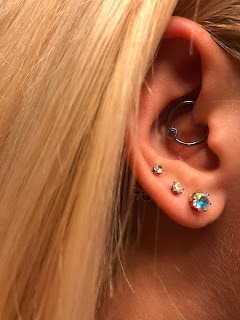 I picked the daith piercing because of the supposed migraine curing properties and because I love the idea of a small, hidden piercing that can have unique jewelry like a heart or moon inserted. Originally, I was going to wait until the fall to get the daith piercing, then my plan was to drag a friend with me while in DC but the day with her was too busy and I missed that window of opportunity. So, on July 2nd, while walking around the National Zoo I decided to call the piercing studio, Fatty’s Tattoos & Piercings, and see if their piercer had availability. She did so I dashed over to Chipotle for a quick lunch and then over to their DuPont Circle location to get my daith piercing done! Once I arrived in DuPont Circle (thank you DC Metro!) I located the piercing studio and let the receptionist know that I was there for a daith piercing. She was extremely polite and took my basic information after letting the piercer know that a client had arrived. The piercer, Valerie, quickly came over to introduce herself and speak with me about the piercing. After looking at my daith she confirmed that there would be enough room to perform the piercing and have it sit correctly. She did inform me that once she was finally in my ear, performing the piercing, she might have to downsize from a 16 gauge to an 18 gauge based on my ear structure. We looked at the jewelry options and I selected a simple captive bead ring with an imitation amethyst because it was one of the titanium options within my budget and would be subtle yet add enough sparkle to be fun. I will be honest that I was dying to get the $300 rose gold ring but it simply was not within my budget. After selecting the jewelry and confirming that I understood the risks involved with the piercing, Valerie left to go prep the room and ensure the jewelry was sterilized. While she did this I completed the final paperwork with the receptionist and purchased the cleaning spray that was recommended by the studio. I did not have to wait long before I was called back to the piercing room. It was extremely reassuring to see that the entire room was clean and smelled fresh yet disinfected. Valerie had me lay back on the piercing table with my head tilted to the left so that she could disinfect and mark the piercing location. While doing this she walked me through how the actual piercing would go and what I might expect pain wise. During the actual piercing part I was instructed to inhale, then exhale slowly through my mouth while the piercing was performed. There was a sharp flash of pain that quickly gave way to a feeling of extreme pressure. I was able to hear the exit hole crunch but overall I would rank the pain a 3 out of 10. It was not fun but I have had worse from migraines or silly injuries. After the needle was properly inserted it was left in place for a few seconds and used to thread the jewelry through. This was an odd sensation, almost like wearing chain threaded earrings but not unbearable. The ball was placed and there was another feeling of strong pressure and a slight tinge of pain while the ring was closed. 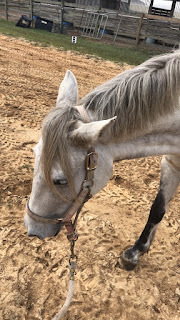 Once the piercing and jewelry insertion was completed the feeling of pressure went away and all I felt was a slight ringing in my ear and being extremely aware of the ring placement. Valerie cleaned the piercing, and stopped the bleeding, then sprayed it with sterile saline. She then walked me through the aftercare, which consists of cleaning twice daily with sterile saline (piercing specific with no additives) and letting it soak in warm water while in the shower. Beyond that, I was instructed to leave the piercing alone and it would heal within 6-12 months depending on various factors. If I wanted the jewelry changed after a few months then I could go to a piercer and have them change it but I was advised to stay with internally threaded jewelry that is titanium or higher quality. Overall, the daith piercing process was extremely simple. It was not the most pleasant feeling but it was not the worst piercing I have ever experienced. That award would go to getting my helix done with a gun at Claire's, 0 out of 10 recommend that experience (Reminder, guns are bad for piercings. Don't be stupid like 18-year-old Laura was.). I was able to walk out of the shop without feeling lightheaded or in pain, just with a slight heaviness in my ear due to the blood rush and addition of jewelry in a strange location. Within a few hours of leaving the shop, I did not feel any different than when I had arrived at the shop. Now for the important part, how did I pick the piercing location and piercer. I searched for a shop that consistently received positive reviews from their customers and was located in a good section of town. This last part was simply because I do not know DC and did not want to end up completely lost. 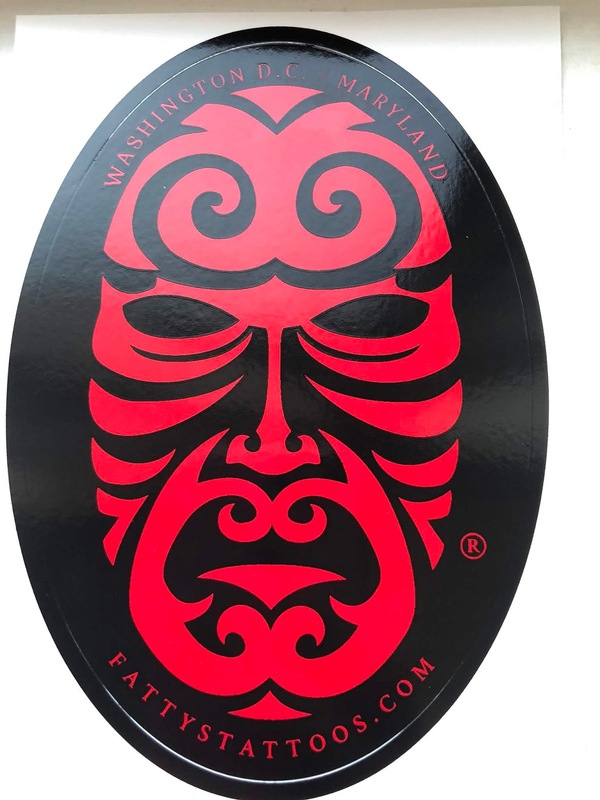 After locating several shops with positive reviews I looked up each individual artist and located their portfolio, Facebook, or Instagram page. I wanted to see which piercer had consistent placement with how I wanted my daith to look. During my research on the daith piercing, I discovered that several piercers tended to place them too shallow in the ear and did not create the illusion that the ring was coming out of the ear canal. As strange as that sounds this is placement I was looking for, so I narrowed my selection down to only piercers that had this placement consistently. Once I confirmed that both these requirements were met I picked Fatty's based off Valerie's consistency with placement and one review that stated she was not afraid to say a piercing would work due to the anatomy of the client. This ability to say no was extremely important to me because I would rather be told the piercing wouldn't work then have a piercing that was improperly placed.